As I have mentioned a few times here lately I am a convert to reading RSS feeds in Google Reader. One thing that really bothers me is when these feeds aren’t shown in full in the feed reader. A recent MamaBlogga post talks more about RSS feeds and how to set them up for WordPress and Blogger blogs. I will expand on this for Typepad blogs. When I first started researching RSS feeds, one of the first things I stumbled upon was Feedburner. Mamablogga talks about it too, but if you haven’t already I’d head over to Feedburner, sign up (it’s free) and then start Smartfeeding. 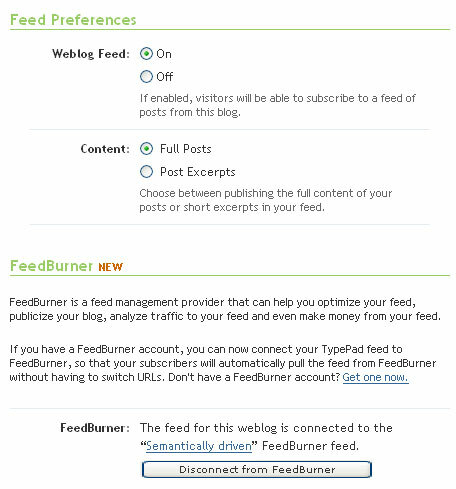 Typepad and Feedburner have teamed up with a widget to make adding your Feedburner RSS feed easily added to Typepad using a Chicklet. Read more about it on the Feedburner website. Typepad makes it pretty easy to do all of this as you’ll see below. Once you’ve done the Feedburner thing, you might need to check your settings in Typepad to see if you’re distributing the full feed or not. On your Weblogs tab, click the Edit Configuration link for the weblog you want to edit, then click the Feeds link to open the Syndication setup page. Select whether you’d like to provide a Weblog Feed. If this selection is enabled, readers will be able to subscribe to your weblog’s feed. An excerpt or a full post (hint hint, full post is good). Select whether you want to provide excerpts or a full post. If you don’t select the full post option, people who subscribe to your feed will have to click over to your actual weblog to read the full post. Personally I don’t do this unless I’m compelled to. I’m more likely to read the whole post if it’s in the RSS feed. This is how this page will look if you’ve done what I’ve written about above (click to view full image). If you don’t want to go down the Feedburner route, you don’t need to. I just find that it’s easier to subscribe to a feed when it’s gone throught the Feedburner route. If you only use the default Typepad feed, it’s harder to subscribe unless you setup something in your web browser. If there’s something I haven’t covered here you want to hear about please let me know. Similarly, if this is all too much and you need more explanation please let me know.